A franchisee shares insights in buying and operating a franchised drugstore. His testimonial can be an important guidance for other entrepreneurs out there. <>I grew up in a family of entrepreneurs. Business anecdotes from my grandparents, parents, aunts, and uncles were staples at dinners and family 'get-togethers.' Right after college, I got involved in running our family’s supermarket business. This experience built my foundation in business management. It also helped me develop the discipline I needed to become a full pledged entrepreneur. Later on, growing our business and being able to provide employment to other people gave me a sense of fulfillment in life. This is why I have continuously pursued other business opportunities. And because I know how challenging it is to run a business, I made sure my other business ventures have a steady supply of quality products, reliable logistics, and strong business support. Thus, I bought Gamot Publiko franchise, which I have been operating for three years now. I am happy and satisfied with the strong business support the franchisor provides. I started with one franchised store in Quezon City and eventually added five more stores (and still planning to add more). I found the franchise to be very profitable and easy to manage, ideal for entrepreneurs like me who are busy with other businesses. Gamot Publiko ’s franchising team ensures that my inventory of medicines is always complete and readily available at affordable prices. This spares me from the time-consuming and stressful tasks of sourcing, negotiating, making payments, and dealing with different suppliers. The franchisor also monitors market prices to ensure competitive selling prices for its products. The reliable logistics means that I don’t have to maintain a warehouse with a huge inventory of medicines. I can replenish my stocks via Point of Sale (POS) and delivery is made regularly to my stores. My franchised drugstores are easy to operate. The system and support that Gamot Publiko has in place allows me to oversee each store even if I cannot be physically present in the locations most of the time. Important reports generated from POS help me in decision making. Plus, staff training is provided and I am assured of continuous guidance. Product updates and important industry news are also relayed to me regularly. The franchise has made me grow personally, too. Knowing that this business not only provides income and employment but also helps those in need of affordable and quality medicine is more rewarding. This experience, along with all entrepreneurial lessons learned, will definitely help me go farther in my business endeavors. 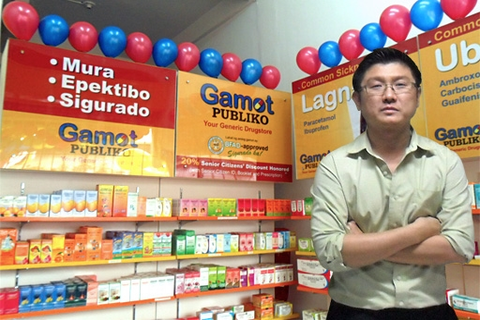 Desmond Chua is a franchise owner of several Gamot Publiko Your Generic Drugstore locations in Quezon City. For more information about Gamot Publiko as a business opportunity, click its directory listing here .